Personally, I found the last generation Blancpain Fifty Fathoms pretty under rated and it is a watch I regret selling despite the fact that it helped me get the current Fifty Fathoms Sport later on. In pictures, it looks plainly ugly. There’s just no way around it. Its not a photogenic watch. In person, there’s something about it that is just mean. It proudly dons a HTFU or I’ll curb stomp you bezel. The X-71 bracelet is also one of the most comfortable (and very dangerous to adjust at home) bracelets I’ve ever tried on. It exudes a high level of finish and with silky articulation on every precise joint. 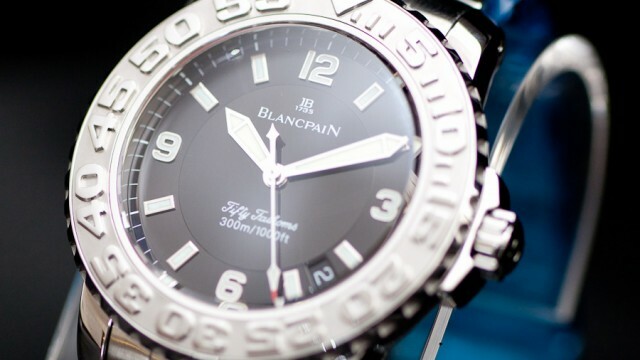 On the side of the relatively thin case, in big bold engraved letters, it lets you know it’s a Blancpain and on the other side, the crown guards aren’t the dainty Submariner style that look like they came from a woman’s watch. (Much love for Rolex, don’t get me wrong) The Trilogy Fifty Fathoms is a piece I’m going to look into acquire again if it comes across my way. 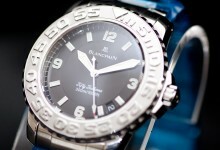 It has a very interesting dimensional dial with fine detailing. Compared to its competitors from the era and even contemporaries today, there are few watches that have as much detail and decoration on the dial. The hands are highly functional and again a boldness comes across with its increasing radius sword hands. The seconds has a strong red tip that give the arrangement some character. There’s something lost in the current Fifty Fathoms Sport compared to its progenitor. While I do think the FF Sport is a superior watch with a better movement, it just doesn’t have that same Lamborghini Haha F YOU personality that the Trilogy edition Fifty Fathoms had in spades. It doesn’t make any apologies for what it is with a flamboyance that is not easily accommodated, it’s a love it or hate it relationship. For the wrist width challenged, this edition of the Fifty Fathoms is also much more manageable with a 40mm width. It is expensive to service but it seems $700-800 is now the normal for a factory movement and case service these days across the range of JLC, IWC, and even Omega with their current line. Well, I know exactly what you are talking about because I have one and it is a great watch. A real beauty, which I will never relinquish!